Mama Cloth Menstrual Pads Review: Are They Right For You? Home » Menstrual Pad Reviews » Mama Cloth Menstrual Pads Review: Are They Right For You? You are ordering 5 piece of 10 inch charcoal bamboo pads. Flow: Equivalent to a regular flow absorbency pad. The environment. Stop putting all that plastic that doesn’t biodegrade into the landfill. This is an eco-friendly product you can feel good about buying. Think about how many disposable sanitary napkins you’ve thrown in the trash over the course of your lifetime. It’s time to make a change and think eco-friendly. The price. Disposable pads are expensive! It’s not uncommon to use an entire box of pads each month, particularly if you have a very heavy flow. Each box costs around $5, so the cost can add up quickly! A package of cloth menstrual pads costs a bit more up-front but can last for years, making it an excellent investment. Pair reusable cloth pads with a top-quality menstrual cup for even more savings. Your health. Stop putting chemicals next to your skin-most disposable pads contain traces of pesticides sprayed on cotton. There are also chemicals on disposable sanitary napkins from the dyes used in the manufacturing process. It’s uncertain as to whether or not these cause things like cancer, but it is known that they do cause irritation. Love my antibacterial bamboo fiber Mama Cloth menstrual pads. That’s quite the name, but the company behind this product is actually “Mama Cloth,” which has a wide range of eco-friendly products including cloth diapers, breastfeeding pads, etc. These cloth pads are made from antibacterial bamboo fibers which will give you a dry feeling next to your skin. They’re an excellent choice for light-medium flow days, or for a heavier day when paired with something like a menstrual cup. They can be a good choice for larger women since they’re a bit wider and longer than the average cloth pad. Quick Tip: Be sure to get a Dutchess Wet Bag along with your cloth menstrual pads. They’re perfect for changing your Mama Cloth pad on the go. Just put your used cloth pad in the wet bag, and take it home without any mess or hassle. Why Consider Cloth Menstrual Pads? Disposable pads aren’t great for the environment. They are made partly from non-biodegradable plastic, and I’m sure you know already that this stuff will still be hanging around the landfill in thousands of years from now. Due to the nature of disposable sanitary napkins, they can’t really be recycled. Compare this to cloth pads which are made largely from natural materials. You can use them for 5-10 years, and then when you do throw them in the trash, they’ll biodegrade easily. 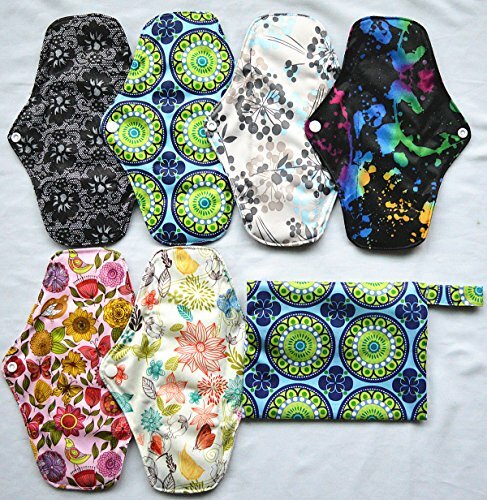 Cloth menstrual pads are a serious win for our planet! One cloth pads can replace hundreds of disposable pads. I don’t know need to tell you this because I’m sure you already know, but disposable feminine hygiene products are expensive. You will spend a bit more money up-front for reusable cloth pads, but you’ll recoup your money in less than a year. Disposable pads and tampons (non-organic ones) contain trace amounts of toxic chemicals. Although the amounts are quite small, exposure to this stuff adds up over time and can cause some serious health problems. The other problem with disposable sanitary pads is if you have sensitive skin. The toxins in them can cause some serious irritation. If this is the case for you, consider making the switch to reusable cloth pads and you’ll likely notice a big difference. Cloth menstrual pads are quite difficult to find at your local drugstore. For whatever reason, they’re just not that popular and even places like Wal-Mart usually don’t carry them. 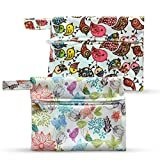 The best place to get Mama Cloth menstrual pads is on Amazon. You’ll have the full range of colours, and sizes and shipping is often free with Amazon Prime. The wings are serious! Most women mentioned that the pads stayed firmly in place, more so than other brands of menstrual pads. Very few reports of leaking on the sides with these popular pads. They come in a cute pouch, perfect for taking one with you on the go. A choice of six colourful designs. The fabric feels really nice against the skin and is breathable, unlike many of the other brands of menstrual pads out there. A bit bulkier than some of the other pads out there. Wide, and long. This might be what you want, but some people don’t. Can shift around a little bit during exercise. One of the reasons why you may consider disposable sanitary napkins over reusable one is that you have to wash them. The good news is that it’s easier than you might think to care for and clean reusable cloth pads. If you don’t care about staining, then just throw your pads in with your regular laundry. If you do care about staining, but cloth pads with a darker fabric that won’t show the stains as easily. Or, soak them in cold water after use, before laundering them. In order to get them to last as long as possible, it’s recommended that you hang dry cloth pads. Drying them in a clothes dryer can be hard on clothes. You could also hand-wash them with a very mild detergent, but this is more hassle than most people want! What to do with Cloth Pads When not at Home? When you’re at home, it’s pretty easy to deal with your soiled Mama Cloth Pads. You just throw them in with your regular laundry. If you care about staining, you could soak them in cold water, or use some commercial stain remover solution on them. However, when you’re out in public, it’s obviously more difficult! Unlike disposable pads, you can’t just throw these into the trash. You could carry something like a Ziplock bag with you to store your fresh pad in. Then, when you have to change your soiled pad, take that fresh one out, and put your soiled pad into the baggie. The only problem with this is that you might obviously feel shy about something seeing your soiled Mama Cloth pad! Most people get around with by using something like a Dutchess Wet Bag. They are bags designed to wet/damp things that are not clear. The designs are kind of cute, and nobody will actually have any idea what the bag is for unless you tell them. Just keep your soiled pads in there until you get home and can throw it in the wash.
Are Mamacloth Pads Only for Periods? A common question that people have is whether or not Mamacloth pads are only for during your period. There are a number of other reasons why you might consider using them instead of disposable products. If you suffer from light incontinence, you may use something like disposable pantyliners to help you deal with this. However, they can cause some irritation due to the toxic chemicals in them, and they can also be a bit expensive if used every day. Vaginal discharge is a normal thing that happens throughout the menstrual cycle, and also during pregnancy, menopause, before puberty, etc. Most people have some leaking after delivering a baby. One way to handle this in a way that’s gentle for your body is reusable cloth pads. 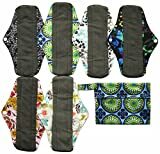 If you’re looking for an eco-friendly, affordable alternative to disposable pads, then mama cloth reusable pads make a nice choice. Mama Cloth menstrual pads are a quality product at an affordable price. 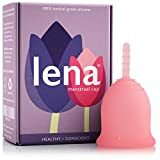 They are most suitable for people looking for a product that they can wear overnight as a backup to a tampon or menstrual cup. Unlike some of the other cloth pads out there, these ones are a serious pad that offer some great protection. However, some smaller people may find them too big. Or, if you have a light period, you may not find this extra level of protection necessary. That said, they’re a reasonably priced cloth menstrual pad that works well. Love it? We sure do. The best place to get Mama Cloth Reusable Pads is on Amazon. Plus, menstrual cups come with a lower risk of Toxic Shock Syndrome than tampons. They also have a capacity 3-4x more which is ideal if you have a very heavy period. If you’re looking to replace your tampons with a cup, then you’ll probably want to know which one we recommend. Mama Cloth Pads: Have your Say! 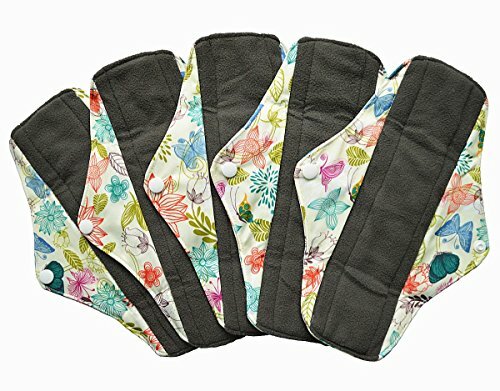 What are your thoughts about these Mama Cloth Pads? Leave a comment below and let us know your thoughts.